My eager craft thru footless halls of air . . . The above poem, written by an American who was killed while flying with the Royal Canadian Air Force, typically expresses how our Jim felt about flying. He read these lines some years ago in a newspaper and clipped the article to keep in his billfold so he could gain new inspiration from re-reading its eloquent impressions of flight. It was still in his wallet when he “touched the face of God” in his final flight on 19 March 1954 four miles from Chanute Air Force Base. I know that he would like to have these lines quoted here so that they might give the same inspiration that he found in them to anyone who loved flying as he did. graduated from Grant High School while we were stationed at Portland, Oregon. The above lines express what were perhaps his most outstanding qualities. His intense desire to excel was evident early in his boyhood. It was demonstrated in one instance that occurred when he was eleven years old. I took him and his older sister for a climb to the top of Long’s Peak in Colorado. After we returned, he told us that he had been higher than anyone else and explained that while he had been resting at the top of the peak he had climbed atop the highest boulder. This same determination to excel was demonstrated in his work in the Boy Scouts. In two years he advanced from Tenderfoot to Eagle Scout. courage and determination Jim showed, even though losing the decision, when he went out of his weight class and fought Syracuse’s 175-pound intercollegiate champion. The good humor, good disposition, and determination which he always displayed when faced with adversity and hardship was perhaps best demonstrated during his sixteen months as a German prisoner of war. Jim’s prison camp comrades invariably tell about his fine sense of humor, his good spirits, and his fine leadership qualities, which helped them immensely during their many dreary months of prison life. While in prison, he organized and taught calculus classes to those whose education had been interrupted by the war. various Army matches and was intensely proud of any success that I had. 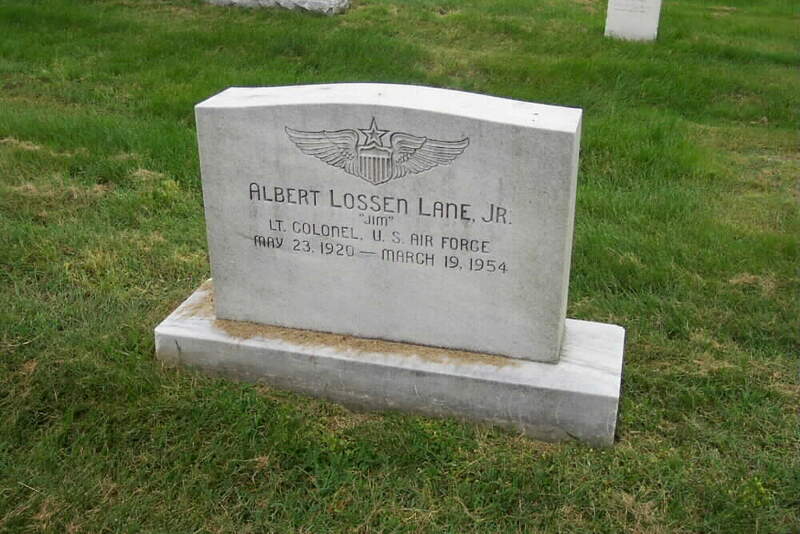 “Lane, Albert L., Jr., (Lt Col USAF). After convincing southern belle Ann Grimes it twarn’t so ‘about the ways of the Air Force men,’ we joined forces Feb ’43. Honeymooned Del Rio, Texas, while transitioning and later instructing in B-26’s. In September 1953, Jim was transferred back to the U.S. for duty with the War Plans Division, HQ, USAF. Squadron was one of his happiest ones. The esteem with which Jim was held in his more recent assignments and the contribution that he made to his service is best described by some of his fellow workers and commanders. Although alert and sensitive to the demands of military duty, Jim nevertheless made it a point and found time to be a good husband and loving father. He loved his family as they loved him. His devoted wife, Ann, shared almost his entire commissioned service with him. Ann’s brother, Chuck, whom they adopted; their daughter Ann, who was born while Jim was a prisoner of war; and their young son, Albert III, shared in a happy and companionable home life. Jim’s family enjoyment was found in the little things — the simple pleasure of taking the family to the swimming pool, a trek through the woods, a game with the children, or a camping trip — all these typify the days he so enjoyed with his family. Our Jim is gone, but he will not be forgotten. While his untimely death has left us filled with sadness, our sorrow is eased by the knowledge that he lived his short span fully and well, and that he fulfilled every ambition that we ever held for him. Also, his passing has given us new faith and inspiration and resolve to live by those principles to which he was so dedicated: Duty, Honor, Country.